Being in a doctoral program, especially one who has a focus on social justice means that you get hit with a lot in any given class and in any given semester. Doctoral programs are often emotional journeys that take a toll on all who enter but those rooted in the investment of people and the aspiration of justice, can be emotionally challenging to a degree that I would (probably failingly) argue is not replicated in other PhD programs. But we feel a lot about things in this program and that can be more strongly realized in the light of the 2016 presidential election wherein the winning candidate represents in many ways so much that is antithetical to what we believe. Thus, my recommendation to others and something I come back to time and again is the need for some kind of mindful and contemplative practice. To make the most of a program like this, I find myself needing a means of stepping back, seeing what's going on, avoiding judging, and, of course, breathing. 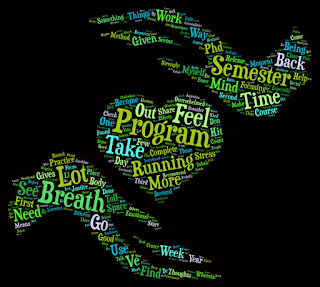 For me, there are a two ways I make space for the stress and intensity of this program. I talk about running a lot on this blog--especially for someone who hated it for three decades. For me, running and learning are inevitably linked and so it seems only fitting that I so often use one to inform the other. 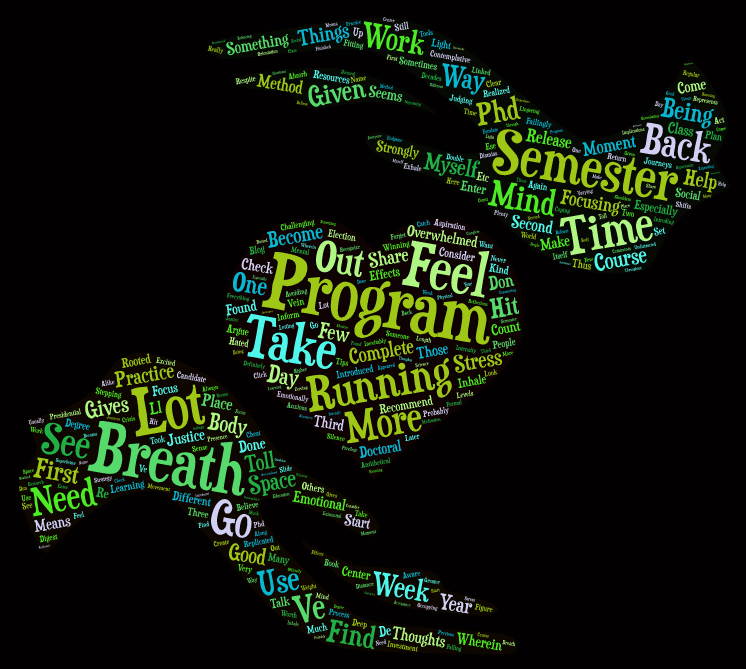 But running has definitely become a regular respite to digest, process, and plan for my work in my program. Sometimes, it's just giving me space to absorb what I've been learning and its implications for my work. Other times, it's the undistracted mental space to figure out how everything is hitting me on different levels. In this vein, the running itself becomes the contemplative practice wherein my clear mind focusing on my body's movement becomes more aware of intruding thoughts about the program and my work. In and of the moment, I recognize the presence of these thoughts and then dismiss them to return to my body. However, their lingering gives me something to come back to later on and consider why they appeared in the first place. In that way, running gives me an opportunity to distance myself from the work and to see what still seems to be occupying my mind (and see if there is something worth considering about it). Being in the program can be very overwhelming (for me) and I've found at times feeling anxious, excited, or overwhelmed. Focusing on breathing has always been a good strategy for coping with stress throughout the world. I have used it at varying times to differing effects. However, SuperBetter introduced me to a more effective breathing method that I find can help me de-escalate in a given moment when I'm feeling the stress taking it's physical and emotional toll. The breathing method introduced there (and I forget the formal name, so you'll just have to check out the book or share it with me in the comments) is that you take in a deep breath but when you release, you double the length of time in releasing as you took for inhaling. So if you inhale for a count of 3 seconds, you exhale for 6 seconds. I've found this method to be really useful in re-centering myself and letting the weight of the moment slide off of me. The focusing on the breathing and count silence the other thoughts going on while the expanding and contracting of the chest along with the shifts in shoulders, back, etc create a sense of things releasing or falling from the body. After completing 5 breaths like this, I see where I'm at and if I need to do 5 more. Usually, I don't but if I do, I never need a third set of breaths. Those are my two go-to mindfulness practices that help me get through this program. I strongly recommend that if you don't have any, take a look at what's out there (there's plenty) and find a few tools to help you for when things get overwhelming (because they will). A good place to start is the Greater Good Science Center as they have lots of resources, tips, and meditation resources for everyone.